We have been baking & making pancakes in our families restaurants for the last 30 years. Its a really long story and thirty-plus years later we are still dedicated to producing superior baking mixes. Our loyal customers often share that we produce the finest-tasting, most consistently performing oatmeal pancakes in the market place today. BACK TO THE STORY....A car was sold....a mixing bowl was purchased....rooms were painted for rent.....another car was sold...It's a family of entrepreneurs, a big dream, and we have had a few losses along our way. and some tragically unexpected as most families. There was a decision to be made and one was for me to start Pancake Power Foods. 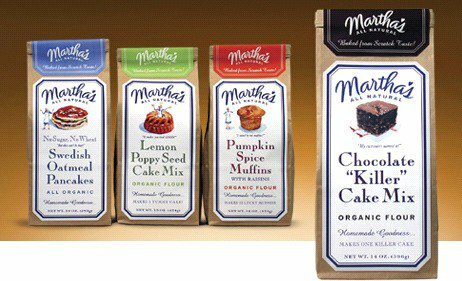 A company that would continue to manufacture Martha's All Natural, provide ingredients and mixes to local manufacturers, bakeries, and local restaurants; and a name dedicated to Michael. We dearly miss Michael and continue to power through by working harder everyday. The recipes we craft blend, are the exact same ones handed down for generations. Like our Chocolate "Killer" Cake Mix & "Killer" Chocolate Sauce - This recipe was originally called The Tavern Cake and was George Washington's Favorite Dessert! The word & addition "Killer" comes from Michael when he was a kid with his friends and when Martha asked him what he thought they said....This is "KILLER" and so since the 70's its been known as the Killer Cake & Sauce! Martha's All Natural Foods & Baking Mixes purveys the best oats, powders and flours. Most of our ingredients are sourced locally and are organic or are non GMO Verified. We blend in small batches for enjoyment & we pack them in small coffee bags, or larger bags for home or restaurant use. Pancake Power Foods provides the best ingredients found in the marketplace. Thank you for enjoying Martha's & visiting our site! Please come back looking for great recipes, new products, and old stories that we will keep sharing!